At the Urasenke Center, Kyoto, by reservation, when there is an exhibition showing in the galleries. Introductory Lessons are suspended until further notice. Please refer to this page again for updates. The lesson involves preparing and drinking usucha, whisked matcha tea of a relatively thin consistency, in the style of chanoyu called ryurei, which employs tables and chairs. 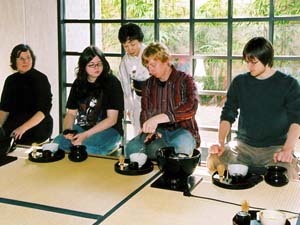 The instructors provide easy-to-understand explanations in Japanese. The lesson takes approximately 1 hour. The Chanoyu Experience is offered as a public educational service together with the exhibition. The exhibition admission fee, paid at the Urasenke Center reception desk on the day of your visit, is the only charge for participation. Novices and children's groups are welcome. A maximum of 12 participants can be seated comfortably per session. Send your name, contact information, number of attendees, and your preferred date(s) and time(s) at least a week in advance (though no earlier than three months in advance) via email to galdata@herelery@numeral.comurasenke.or.jp. Put "Chanoyu Experience reservation request" in the subject line. Please understand that your reservation is not official until we send confirmation of it. Please note that the instruction is given only in Japanese. While ability in Japanese is not necessary to participate, those completely unfamiliar with the language may wish to come with someone who can provide translation.